To learn the specific charge/discharge characteristics of a Lithium- Polymer(Li- Po) battery through experimental testing of a remote triggered Li- Po Battery. Lithium polymer batteries are rechargeable battery of lithium-ion technology in a pouch format. Unlike cylindrical and prismatic cells, LiPos come in a soft package or pouch, which makes them lighter but also less rigid. Understanding the float behavior of batteries, or how the voltage of a battery changes when a charge or discharge process is stopped. A battery is an electrochemical device in which electrical energy is converted and stored in chemical form for storage. The chemical energy can then be easily reconverted into electrical energy. Two primary types of chemical batteries exist: Primary and secondary. A primary battery is not normally rechargeable and is designed to only last one discharge cycle, after which it must be replaced. Secondary batteries are rechargeable. They can be discharged and recharged repeatedly. As we are all aware, a significant number of the modern electronic equipment we take for granted every day, such as mobile phones, laptop computers, music players, cameras and countless others are powered from rechargeable batteries. An Electrical Load is applied to the cell, causing the cell to discharge. In many batteries, the chemical reactions are reversible when voltage is applied to the battery (Charging). Rechargeable batteries are also called Secondary batteries, as opposed to Primary batteries, which are single use only. The voltage of an individual cell is fixed by battery chemistry. The current is a function of the rate of chemical reaction in the battery, which is characterized by the Equivalent Series Resistance (ESR). Then from OhmÃ¢â‚¬â„¢s law, we can see that for a fixed voltage, the current is controlled by the resistance. Capacity = (Voltage) * (Amp-hours). The Amp Hours is the number of Amps that a battery can produce for an hour OR the number of hours a battery can produce one Amp. For example, if the battery has a 10 Ah (Amp hour) rating, it can provide:1 Amp for 10 hoursOR10 Amps for 1 hour.The capacity is usually defined at a standard charge/discharge rate (C-rate), which is the the charge/discharge rate (in Amps) that the battery will provide for the specified # of hours. 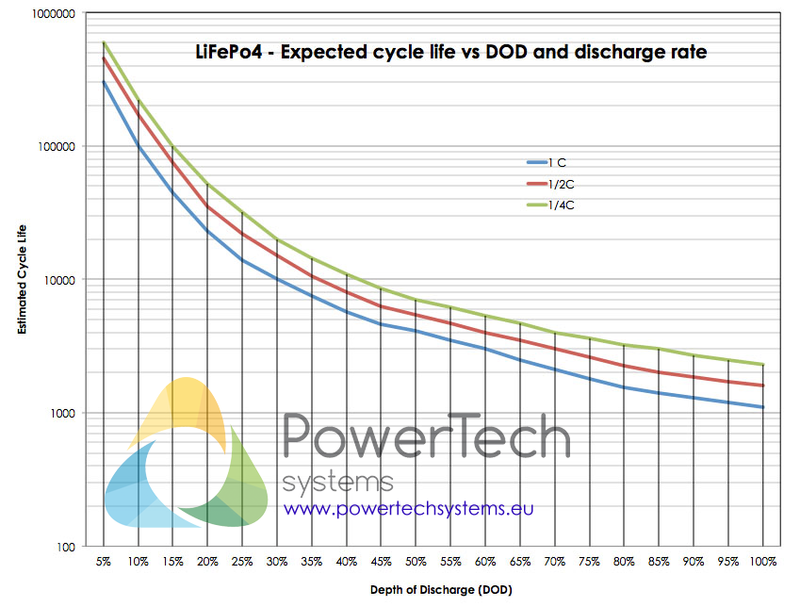 For example, under discharge, C/10 = 5.2 A implies that the battery will provide 5.2 Amps for 10 hours. The capacity usually increases for lower charge/discharge currents and decreases for higher charge/discharge currents. Series connection adds the voltage of two batteries, keeps the capacity as same (Ah). Two 6V Batteries joined in series produces 12V, But the total capacity is still 10A. Parallel connction increases current rating but the voltage ramains same. 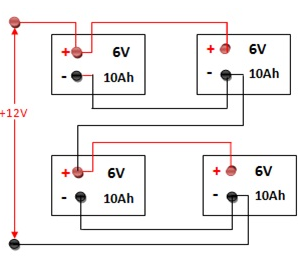 Batteries connected in series/parallel increases both the voltage output and current rating. Two sets of batteries already connected in parallel are joined them together to form a series produces 12 V and 20 Ah. The voltage of a Li-poly cell varies from about 2.7 V (discharged) to about 4.23 V (fully charged), and Li-poly cells have to be protected from overcharge by limiting the applied voltage to no more than 4.235 V per cell used in a series combination. The lithium-polymer differentiates itself from conventional battery systems in the type of electrolyte used. This electrolyte resembles a plastic like film that does not conduct the electricity but allows the ion exchange. Since the metal casing is absent, it is much lighter than the Lithium ion battery. The lithium-polymer electrochemistry currently covers a wide range of active materials such as LiCoO2, LiNiO2, and its Co doped derivatives. Harding uses LiCoO2 chemistry. When Lithium Polymer cells are first charged, lithium ions are transferred from the layers of the lithium cobaltite to the carbon material that forms the anode. Subsequent discharge and charge reactions are based on the motion of lithium ions betweenanode and cathode. During charge/discharge Li+ ions are transported back and forth between two insertion electrodes. A strict charging regime is necessary to properly and safely charge Lithium Polymer batteries. Most batteries contain a protective circuit to prevent overcharge and over discharge. This circuit limits the charge voltage to a maximum 4.2 Volts. The circuit also contains a thermal sensor, which disconnects charge if the temperature reaches 90 Ã‚Â°C (194Ã‚Â°F). If a cell is inadvertently overcharged, the cell may heat up and vent with a flame.